There are combo-shops that sell döner kebabs and pizza on every other corner in Prague’s city center, and the luscious smells—a unique combination of hot fat (from the kebab) and oregano (from the pizza)—that waft through the serving windows make my mouth water every time. I was pouting a little bit the other day, wanting to just stuff a pita-bread wrapped kebab in my face, when I remembered: There’s an awesome Chicken Shawarma recipe in Well Fed Weeknights. We’re having it for dinner tonight. Bonus etymology lesson: Shawarma is an Arabic version of the Turkish word çevirme, which means “turning.” The words döner and gyros also refer to turning. Yes, the whole turning thing seems pretty important to authentic shawarma. My shawarma recipe is based on chicken breast, but you could certainly use the same spice blend on lamb or beef, if you prefer. To me, it’s the toppings that really make the fun: shredded raw veggies, creamy tahini sauce, maybe a spritz of lemon juice, or a few pickles… you really can’t go wrong if you include contrasting colors and textures. Cook the chicken. Heat the oil in a large, nonstick skillet over medium-high heat, 2 minutes. While it heats, make the spice blend: Mix together all the spices in a small bowl. Rub the spice blend on both sides of the chicken, then place the chicken in the pan and cook it undisturbed, 5 minutes. Flip the chicken and cook for 2 minutes, then add the water, cover the skillet, and reduce the heat to medium-low. Cook until the chicken is no longer pink inside, about 10–15 minutes. Make the salad. Use the slicing blade on a food processor to thinly slice the cabbage and carrot. Place the vegetables in a large mixing bowl and toss with the lemon juice, olive oil, salt, pepper, and mint; set aside. Make the tahini dressing: Smash and peel the garlic, then place it in the bowl of the food processor. Add the remaining ingredients and whirl until smooth. 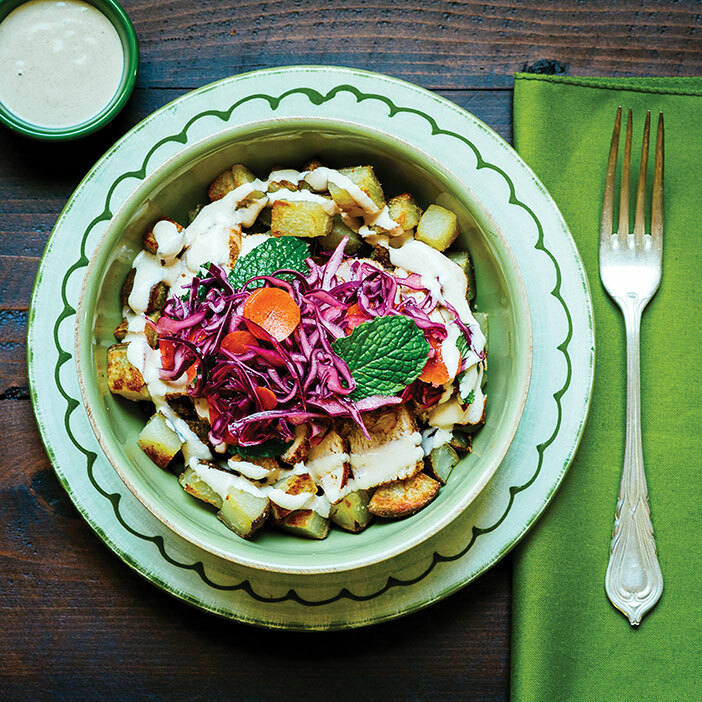 To serve, cut the chicken into thin slices and place it in a bowl, then top with salad and drizzle with tahini dressing. You also would not be wrong if you added some Grain-Free Tabbouleh, Baba Ghanoush, or Lebanese Onion & Parsley Salad to the bowl. You could also add some chopped pickles for extra salty zing—or even a little gut-friendly sauerkraut. You’re so nice! I’m glad you like the print outs, and I’m really glad you’re enjoying the recipes. Thanks for reading and buying our cookbook! That sounds so yummy! I never thought to cook chicken breasts that way, fantastic! Thank! Hi! I love chicken shawarma and can’t wait to make this recipe! Do you think this would work all thrown together in the crockpot? Just wondering as I have 6 kids and it’s easier to batch cook that way for me. Thank you! Love all your recipes! You can cook the chicken in the slow cooker, the assemble the rest when you’re ready to eat. It won’t be quite the same, but it will still be good. Just sprinkle the chicken with the spice blend and place the chicken breasts in a single layer in the bottom of your slow cooker. Cook on low for approximately 3 hours until the chicken reaches 165F on a digital thermometer.